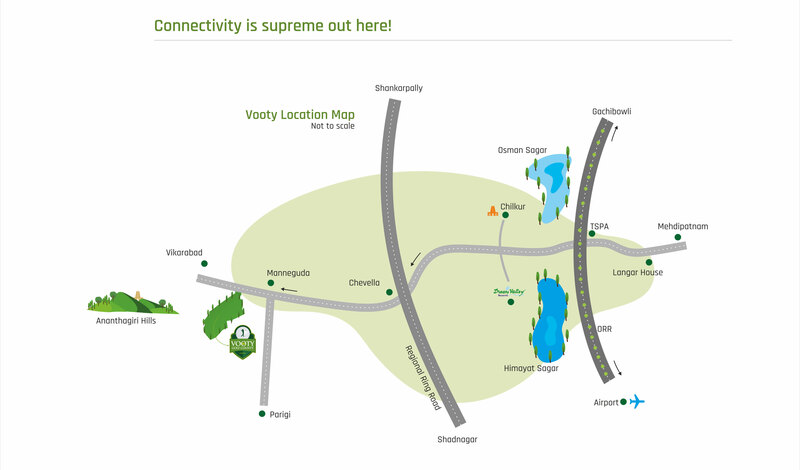 Located at the foothills of Ananthagiri Hills, Hyderabad, Vooty Golf County is a deluxe venture in the lap of nature. The travel time is just one hour from Gachibowli or from the airport. Vooty Golf County will have a close proximity to industrial and technological parks in the coming years. The most striking feature of this amazing landscape is its noise-free and pollution-free environment. Fresh air, easy drives, connectivity and proximity to Vikarabad are some of the key elements in this eclectic mix of a venture!